The F22 Raptor airplane dominates the skies, but the supercharged engine in the truck has the land covered. One of the few feelings better than getting all four of a Ford F-150 Raptor’s tires off the ground during a massive jump is doing so with the full knowledge that the money you spent on the truck went to charity. Well, that and the fact that your Raptor is better than everybody else’s because it has an additional 95 horsepower on tap compared to everyone else's Raptor. 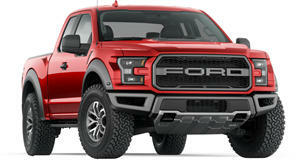 Thankfully, that’s all possible thanks to this one of a kind Ford F-150 Raptor that’s being auctioned off by EAA. EAA stands for the Experimental Aircraft Association, and like any well-intentioned organization, it supports both the favorite hobby of the people within the organization and donates to charity. To complete the latter task, the EAA got ahold of a Ford F-150 Raptor and tricked it out. It started by giving its 3.5-liter V6 engine a supercharger, which makes it good for 545 horsepower. Custom wheels and tires, upgraded brakes, carbon fiber bodywork, off-road LED lights, and a unique exterior further helps separate the the truck from the rest of the Raptors on the road. This version garners the name “F22 Raptor” after the military airplane by the same name. The truck will be put up for bid during the annual EAA Gathering of Eagles on Thursday, July 27, with the proceeds being donated to support youth education work. There’s no telling how much the F22 Raptor will fetch at auction, but this is one badass truck and the cause is good, so don’t expect well-heeled philanthropists to hold back.